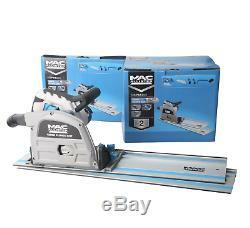 Plunge Saw With Guide Rail Track Circular Electric Hand Wood Power Tool Best New. 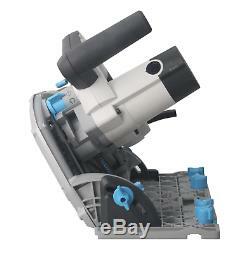 This corded Plunge Saw With Guide Rail is ideal for cutting wood and plunge cut. 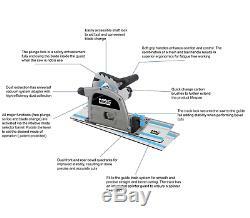 Invest in our Plunge Saw with Guide Rail and youll discover an easier way to make complex cuts without having to build complicated jigs for your worktable. 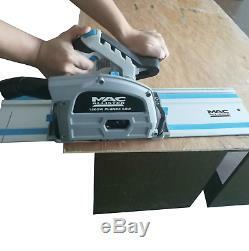 When used in combination with a lightweight guide rail, plunge saws are hard to beat for straight cuts. The guide strip on the edge of the rail can be used to place the saw blade exactly on the cut line, regardless of the angle of the saw. 6000 RPM no load speed. 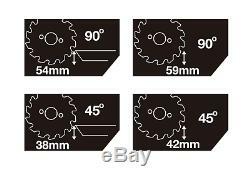 54mm maximum cutting depth at 90° and 38mm maximum cut at 45° mitre. Trigger switch, Soft grip and 3 m cable. 3 in 1 mode selector. Cutting without track contains maximum cutting depth at 45° bevel and maximum cutting length at 90°. You can only cancel the order within one hour of purchasing it. By purchasing this product you confirm you are happy and understand with the product information in the description. Our electronic products are manufactured according to the specifications of the UK Electrical Standards and Codes. We assume no responsibility if the items malfunction or cause an accident because one tried to use the product with foreign electrical standards. The use of a converter or other voltage transforming device is at your own risk. We will look to respond ASAP. 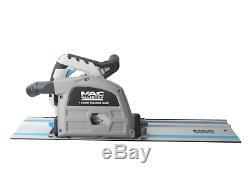 The item "Plunge Saw Guide Rail Track Circular Electric Hand Wood Power Tool DIY Circular" is in sale since Monday, August 20, 2018. 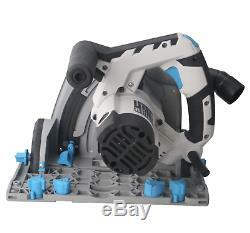 This item is in the category "Home, Furniture & DIY\DIY Tools & Workshop Equipment\Power Tools\Saws & Accessories\Circular Saws". The seller is "warehousebulkclearance" and is located in United Kingdom. This item can be shipped to United Kingdom, Austria, Belgium, Bulgaria, Croatia, Cyprus, Czech republic, Denmark, Estonia, Finland, France, Germany, Greece, Hungary, Ireland, Italy, Latvia, Lithuania, Luxembourg, Malta, Netherlands, Poland, Portugal, Romania, Slovakia, Slovenia, Spain, Sweden, Australia, United States, Canada, Brazil, Japan, New Zealand, China, Israel, Hong Kong, Norway, Indonesia, Malaysia, Singapore, South Korea, Switzerland, Taiwan, Thailand, Chile.